Ryan Sweeting takes on No. 1 Rafael Nadal in his second-round match. Michael Russell next meets David Ferrer. MELBOURNE, Australia - Ryan Sweeting and Michael Russell haven't scored a ton of Grand Slam wins -- in fact, they have eight between them -- but both came through in sterling fashion in the first round of the Australian Open, when Russell bested Aussie Matthew Ebden, 6-3, 6-2, 5-7, 7-6 (9), and Sweeting took a 6-4, 6-4, 6-1 win over Daniel Gimeno-Traver. The grand prizes for the 23-year-old Sweeting and the 32-year-old Russell: second-round clashes with Spain's top two players, No. 1 Rafael Nadal and No. 7 David Ferrer. Despite going through numerous ups and downs in his career, Russell is still intent on cracking the top 50 for the first time. He keeps himself in good shape, is still fast and is trying to dictate, more than merely being a retriever. He had some very rough patches vs. Ebden, but on his fourth match point in the tiebreaker, he rushed the net on a mediocre approach shot, trying to put the pressure on his foe, and it paid off, as Ebden missed a backhand crosscourt wide. It was only Aussie Open win No. 2 for Russell, but he felt very good about it. "I got a little tight, and he started playing better, and it was just a dog fight," said 100th-ranked Russell. "I didn't want to give him anything and not let the crowd be a big factor, and for two-and-a-half sets, I did a great job of that." 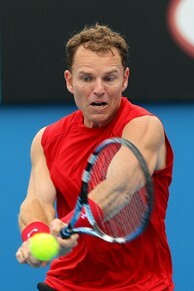 Russell, who gave 2009 US Open champion Juan Martin del Potro a tussle at last year's Aussie Open, was just one of eight American men in the main draw when the tournament began, and with the losses of Donald Young and Sam Querrey, he is now just one of six. Not the tallest guy on tour, he has learned to survive by improving his nutrition, fitness routine and how he practices. He realizes that it is unlikely that he'll ever win a major, but that doesn't mean he has lost self-belief and can't make the most of his abilities. "If they get through me, which is highly unlikely, Roger looks amazing already, and Rafa isn't being very charitable, so those are the two to beat," joked Russell when asked who the tournament favorites are. "But Roddick, Murray and Djokovic are all playing well, and there's always some unexpected guy who can break through." Russell obviously has a difficult match coming up against former US Open semifinalist Ferrer, who is just as fast as he is and has a bit more power. Plus, Ferrer is coming off a title run in Auckland. As steady as both men are, a four-hour match isn't out of the question. "Ferrer makes a lot of unforced errors," Russell said with a laugh. "We will have some amazingly long points." Sweeting won only the second Grand Slam match of his career by swarming all over Gimeno-Traver. The former US Open boys' champion spent the off-season working on his serve at Saddlebrook Academy with John Isner's coach, Craig Boynton, and really benefited. He hasn't dropped a set in three qualifying matches and one main-draw contest. Plus, he considers it his first legitimate win, as his prior victory over Guillermo Coria at the 2006 US Open ended when the Argentine retired at 4-2 in the first set. "It was good to get over the hump and get the monkey off my back," said Sweeting. "I think my work with Boynton really helped me a lot. His tennis IQ is so great, and coming into the Slams, most guys are anxious, and he explained it's a long day, three-out-of-five sets, take a deep breath. His big thing is you can't want to win. You have to want to execute, and that helps me a lot." Sweeting was coached by Dustin Taylor for the past two years, but Taylor has now taken a job with the USTA. However, Sweeting, who is looking for another coach, credits Taylor with making him an effective all-round player. "He took my game to where it is right now because it was all over the place," Sweeting said. "I owe him everything." As well as Sweeting has played, going up against Nadal -- who has won three straight majors -- is a huge task. Nadal almost never chokes and is totally familiar with the big stage, while the biggest court Sweeting has ever competed on is the US Open's No. 3 court, the Grandstand, where he lost to Marin Cilic. Nadal and Sweeting will certainly be on one of the Australian Open's two main courts. "It's the biggest stage I've ever played on, and I'm excited about it," Sweeting said. "I'm going to have to serve well, be aggressive, not give him looks on his forehands and not get in control of points because once he does, you are done." It's not the first time that the 6-foot, 5-inch Sweeting qualified for a Slam, as he cracked through the Wimbledon qualies last year before falling to Benjamin Becker, a result he was disappointed in. Currently ranked No. 116, he does not see himself a bottom-rung player. "I definitely see myself as a top-100 player," said Sweeting. "I've put in work and effort and am excited about 2011. My ranking hasn't gone up fast, but it will continue to rise." Sweeting has played some significant players before, including James Blake, Cilic and Fernando Verdasco, but not the caliber of nine-time Grand Slam champion Nadal. He's happy that at least for this month, he's coach-less, as Sweeting says it's made him become more self-reliant. He realizes that Nadal is going to demand a lot out of him mentally and physically, but he feels up to the challenge. "He so comfortable out there and is favored to win every match he plays easily, at least in the early rounds. I have nothing to lose, can go out there and crush every ball I can, and that's all I can do. I want to see how I can match up against the No. 1 player in the world and take that experience from the match, win or lose."